I had time to kill today so I dropped by Home Depot to see whether they really are carrying Four Winds Growers trees. And indeed they are, although rather trickily mixed in with different citrus, and looking kind of leggy and bad. No Cara-Cara or Key lime, which was not a huge surprise, and no decent mandarins, which was (mandarins are very popular in San Luis Obispo). I've been dithering between a Satsuma and a Clementine for the better part of a year. The rest of the plants at Home Depot were pretty sad, too, which was kind of a bummer (bins upon bins of bare-root roses, weeks after the reasonable bare-root planting time here, some breaking dormancy). On the other hand, the bins of bulbs were marked down. Most of the bulbs were shriveled and dry, it is true, but diligent pinching and picking through yielded a nice variety. It wasn't until I was checking out that I realized how much I had picked out. Yikes. 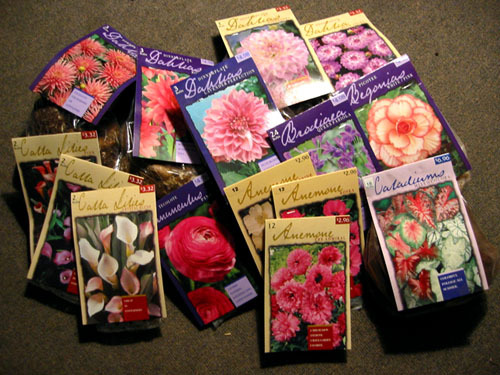 Yeah: 11 dahlias, 36 anemone, 6 coloured callas (I'm still unconvinced that I will like them), a bunch of assorted other stuff. It does look like a lot, doesn't it? Mostly packing material, I'm afraid, but them's the breaks at a store like Home Depot. I don't think they know how to sell loose bulbs. It's a violation of my usual garden rules to buy sketchily identified plants at a chain store, so we'll see how this comes out. I was disappointed to go next door to Costco and find no bulbs at all, because against all odds every plant I've ever bought there has been great, but Costco is so hit-or-miss that you can't really count on it. They did have a weensy little greenhouse, 6' x 6', very cheap, if anybody is looking for such a creature.